Five 401(k) millionaires share their secrets to reaching their first million in retirement savings. 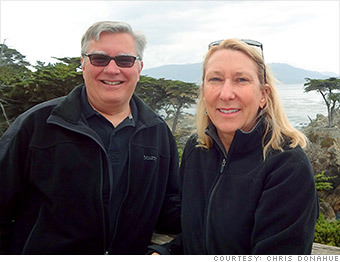 The Donahues both started saving for retirement when they were in their 20s. After decades of saving, Chris and Laurie Donahue have both accumulated million-dollar nest eggs. Each started saving as soon as they began collecting a regular paycheck in their 20s. "We've been at this for 33 years and have never stopped investing, even when the markets go crazy," he said. Donahue, who works in the tech industry, said he was putting away more than 10% of his earnings when he was earning around $22,500 a year in 1981. Now, he earns six-figures, making it much easier to set aside that kind of money. This year, both will make the maximum allowed 401(k) contribution (for their age) of $23,000, which represents between 11% and 15% of their salaries. "It's hidden money," he said. "It may not show up in your check every month. But you'll need it eventually."